MTV, the Peter Pan of TV networks, never grew older. People like Ken Ober did and were tossed aside. Back when they played music on MTV… back when I had the hots for Martha Quinn… there was an MTV game show: Remote Control. Ken Ober, Remote Control’s host, died today. He was 52–too old for MTV but way too young to die. 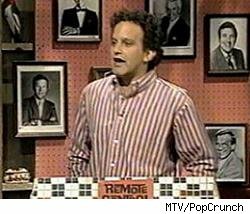 Remote Control was more skit comedy show than game show. Along with Ober there was Colin Quinn and, at various times, Adam Sandler, Denis Leary and Kari Wührer (who I also had the hots for). MTV, the Peter Pan of TV networks, never grew older. People like Ken Ober did and were tossed aside. Too old to rock and roll–or at least too old to rock and roll with today’s viewers. That’s a shame. I ran into him at an ice show in Hartford many years ago. I just wanted to say hello and tell him how much I enjoyed the show. As I began to introduce myself he said he was from Hartford and already knew who I was. I liked that more than a little. Remote Control and it’s cast were witty. Witty was an acceptable MTV component then. Not any more. I really liked that game show as well – it was when MTV was really in its heyday – RIP Ken. Previous Previous post: Is This Really What America’s Clamoring For?